There is really no doubt, that becoming a digital nomad is a dream for many people out there. And all it actually takes is finding a job that you can do on the go! Of course, it should also pay good enough for you to continue your way around the world. So, if you didn’t already get it, I want to say that it is crucial for you to understand which jobs are actually worth taking on. You know, to avoid suddenly finding yourself somewhere abroad, with no money and without a chance to earn something. One thing is clear, as long as you have access to internet there are plenty of things you can do. Because we are talking about digital nomads here, I won’t go into doing different jobs in hotels, cafe’s etc, since your aim is to move around! And there is a serious problem here. Because there are so many different opportunities for you to make money online, you might get caught in doing something that just doesn’t pay back. Yes, that is not all and there definitely are more thing you can do. I don’t want to spend too much time describing all of them, so if you are interested, take a look at them yourself. Here is great article (465 Ways To Make Money Online) by Matthew Woodward. Try to avoid going all in on jobs that require relatively low skill levels. There is of course nothing wrong with doing a job that does not require a lot of skills and knowledge. However, it doesn’t really provide for a truly stable income and the competition is just huge. A good example for this is working as a freelance writer (other freelance jobs can be added too). Of course, if you are an expert in a specific area and you establish yourself as a trusted freelancer, it can all go well. And this means, you most likely won’t be making anything if you have to compete with such freelancers. You are working for someone else and putting money in their pocket, not yours! There is a good side to this. If you spend time doing something that isn’t really made for you, take it as a lesson. I know very well from my own experience, that the best way to find out what you want to do, is by doing the things you don’t like or that do not satisfy you completely. The idea to this is – if you do something you really don’t like doing, your brain will start THINKING of what it is that you would like to do. So what would I suggest you do? First of all, work for yourself! This means, that from the options mentioned earlier, you should consider affiliate marketing. This is what has proven to be the best for me and so it has for many travelers out there. The best thing about doing affiliate marketing is that you can create different forms of content and do it in a niche that you feel comfortable talking about. If not, there is always a chance to find a profitable niche and let others do the work for you. You know, get some freelancers to do the content creation part of the job. 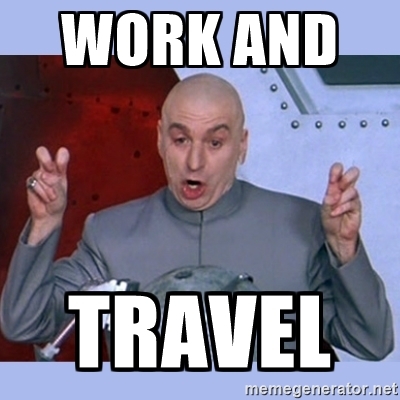 One more thing, if you do it right and get the ball rolling, you will earn more than enough to cover all of your travel costs. And I am not talking about being a budget traveler here! Creating quality content for your audience will lead to a high-income affiliate business that provides stable income in the long-term. And this is exactly what I like about it. The word “long-term”! Because as I have said before, you should be looking to build a business, that lasts. You know… so that you shouldn’t start all over again every year or so. With freelance work – there’s only 24 hours in a day, there’s a limit to how much you can write. You cannot create content 24/7. While with affiliate marketing, if you got the process moving well on its own, you can still be making money while you sleep, sit on the toilet or drink a cold beer by the beach! The form of content you decide to create in order to sell products thru one of the many affiliate partner programs available is all up to you. So is your choice of working with one of the affiliate programs itself. This will largely depend on what exactly you want to talk about and what information you want to provide to your audience. You see, when it comes to building an affiliate marketing business which can be later turned into a business within which you sell your own goods, you have to be willing to put in the work. There are a handful of skills required to do all of the work. More importantly, you have to have patience. My first affiliate site, for example, became profitable after about 6 months of launching it. Plus, I had to make some investments in creating the site and the content. Since I mentioned the investment, I have to say this. It is possible to go thru the process without having the different skills if you are good with managing work and have enough money to put into the project. In this case, you can get freelance specialists to do all of the work for you. This sounds a lot more complex than it actually is. Ok, I am not saying it is easy because it is not. But when it comes to acquiring new skills, there are plenty of options to do that online. As you can see by now, becoming a successful digital nomad is not as easy as one might think. But, if you are ready to work hard and be consistent with your work, there is no doubt that it will all work out for you. And that means, that there is definitely a dark side to being a digital nomad.